Dentures are well-known as a convenient removable teeth replacement, but the newest generation of dentures makes them a better option than ever. 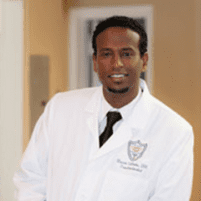 Mussie Sibhatu, DDS, MS, and the team at Laurel Smile Dentistry in Oakland, California, offer options like implant-supported dentures and All-on-4®, as well as traditional partial and full dentures. Book your dentures consultation online or by phone today. How do partial removable dentures work? Partial removable dentures, which replace some but not all of your teeth, work in a similar way to full removable dentures. You remove them daily for cleaning. Partial removable dentures include a plastic resin base, colored to match your gums. The base suctions snugly around your bone ridge, where your teeth once were. The teeth portion of removable partial dentures is typically made from cast Vitallium, a metal-based material that's lighter and more natural-feeling than plastic. Transitional partial dentures are a short-term partial removable denture option that's often used for dental implant patients at Laurel Smile Dentistry. They're often used to maintain your teeth spacing while you're waiting to heal from a tooth extraction so your dentist can place new dental implants. How do full removable dentures work? Full removable dentures replace all the teeth in your mouth. Like partial removable dentures, they're made from a plastic resin base and cast Vitallium replacement teeth. Since your gums shrink some after tooth extraction, you have to wait at least several months for full healing to happen before you get permanent dentures from Laurel Smile Dentistry. You'll wear immediate dentures during that period. They also help you maintain your appearance and adjust to the feeling of dentures. Your full removable dentures look near-identical to your natural teeth. If you remove and carefully clean them daily, they can last for years. Implant-supported dentures use two or more dental implants per arch to enhance denture stability. Your denture arch attaches directly to the implant bases using either clips or other secure titanium attachments. Generally, an implant-supported denture arch easily and securely clicks into place. As with full removable dentures, you remove implant-supported dentures for daily cleaning. It's important to also brush around the implant sites. All-on-4 is a hybrid implant and denture system. Each arch of your mouth gets four dental implants, and a replacement denture bridge then permanently attaches to those implants. All-on-4 can be a great denture option if you want something with lower maintenance than permanent removable dentures. Schedule your consultation at Laurel Smile Dentistry online or by phone to learn which denture option is right for you.